I stayed up later last night than usual considering I did nothing, but then I got to sleep in because I wasn't running until 9:30am. 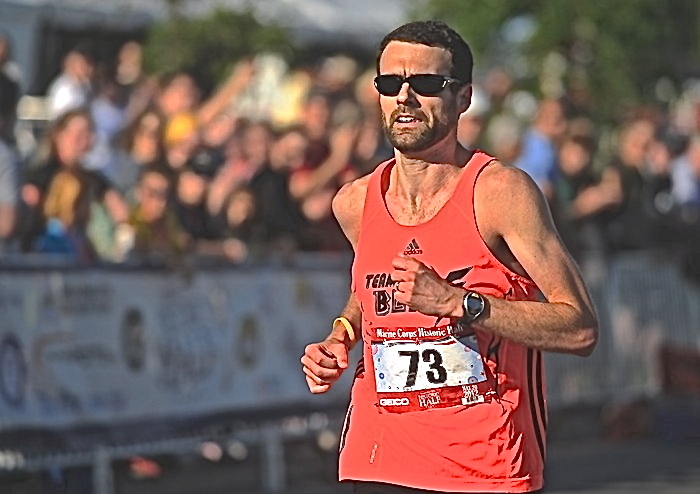 So I was up in time to watch the live results of Tim finishing 3rd place at the Mardi Gras Half-Marathon in 64:21, qualifying for the Olympic Trials. Pretty sweet. Maybe now you can come to the wedding? I met with Bob, Jack and someone named Vikki that I don't know but they did. We went to the quarry and through Central Park and Cowan. We ran in the trails behind the police station for the first time in a long time. It was a very easy 8+ miles. 7:45 pace on average, just because the trails and the Shoneys sign slowed us down a lot. I tried not to run fast. It's startling how slow the 7:30 pace felt compared to doing the same pace on a weekday morning at 4:45. Sleep is an amazing PED. Afterwards, I went home to eat and change into dry clothes and Bob and I went to lift. It was my first lift since January 16. I did the same weights I did then but I was definitely more taxed doing them today. In fact, leg extensions hurt for the first time ever. And it was less weight than I think I used to do. I guess running every day can do that to you. Also of note, I ran the same amount of time today that Tim did. Sad. [Editor's note after the fact:] I'm drinking wine from a can. For no other reason other than to drink wine from a can.